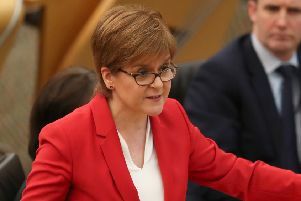 The Scottish Government has denied a Cambridge student who burnt a £20 in front of a homeless man is a “direct” relative of First Minister Nicola Sturgeon. Student Ronald Coyne was allegedly caught on film setting fire to the banknote whilst wearing a white bow toe and tails in Cambridge. He was kicked out of the Cambridge University Conservative Association where he was the communications officer. A source said he told fellow students over a number of years he was Nicola Sturgeon’s nephew, but a spokesman for the Scottish Government denied he was a direct relative. He added: “The individual is not a direct relative of the First Minister or her husband. A spokeswoman added: “They are not really related, the connection is so distant it doesn’t even count as a relation, there are six or seven degrees between them. “He might go around saying he is her nephew but he’s not. A Cambridge University Conservative Association spokesman said the behaviour was “abhorrent and repugnant”. He added: “The CUCA committee became aware of serious allegations against Ronald Coyne late last week concerning his private behaviour. “This disgusting and abhorrent behaviour occurred completely independently of CUCA, and did not take place before or after any CUCA event. “This is borne out by our term card and Facebook events. His resignation was immediately demanded and we determined the appropriate response to be to permanently revoke his membership and bar him from all future events, which we did on Saturday. “There is no place for people who behave like this in CUCA, however we must emphasise that he was no more representing CUCA in his behaviour than he was another other University Association of which he may be member.